So this weekends challenge was amazing. It was fun, and darn tasty. My idea was to use a pancake batter mixture for the bun. I mixed in some fresh bacon to give it some extra flavor. The burger patty was 7% fat and stuffed AND topped with Havarti cheese. The only topping other than that was some BBQ sauce. Enjoy the pictures and the video. Husband, Father, Christian, Web Designer, WordPress Fanboy, and lover of all things geeky. I work as an Experience Designer and enjoy pushing pixels. I love to BBQ and want to express creativity through the delicious meals showcased here. Happy Grilling! WOW! This looks awesome and you even posted a video. This is gonna be a one great epic battle. 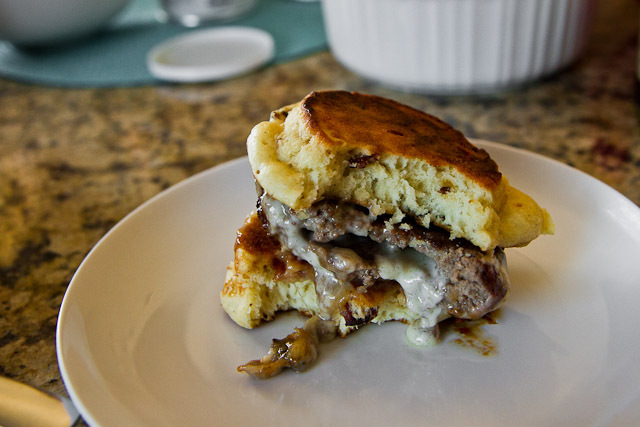 BTW, your patty stuffed with cheese is known as a Juicy Lucy in Minneapolis, Minesota. I have tried it once before and it is so good. I almost did that this weekend. HA! This is so awesome. Looks like more of a dessert than an entree! That video was fantastic. The facial expressions between scenes and “that’s what she said” commentary were classic. I can’t wait to try this recipe. I actually got the idea for the Cheese-Stuffed burgers from a show called “Man vs. Food” where he went and tried the “Juicy Lucy”. It looked so good I had to try it myself. Haha awesome! 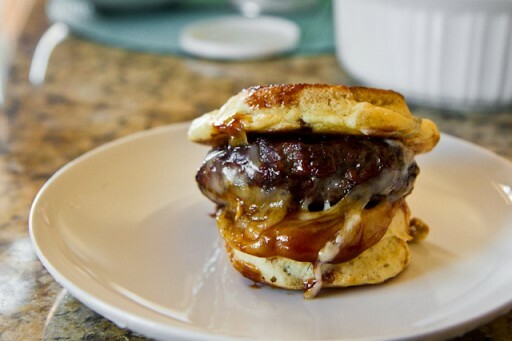 I was really hoping to see an egg slapped between those pancake buns and a little syrup instead of bbq! 🙂 Looks mad delicious though! My wife wanted me to put Maple Syrup on it as well. Maybe I’ll have to try that next time you guys are over for a BBQ. That looks like a hot sweet mess. I’d love to have one right now. Although I’m fairly certain I’d feel terribly guilty afterwards. Guilty but satisfied. And the bacon too? Dang. I had the privilege of enjoying a bite of this masterpiece. It was pretty amazing. I’m trying this at home. That looks awesome! I’m going to make one too. I have to admit, the random “that’s what she said” comment was hilarious in your vid!! !